Manicotti is one of those things that is just so amazing. These taste so great, truly a gourmet meal, fit for a king. Ever since I was a small boy, I loved these even better than stuffed shells or ravioli. One of my all time favorites. 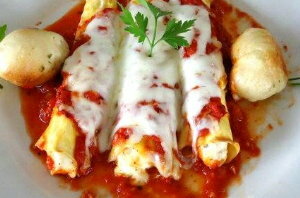 The thing that makes these manicotti amazing is the pasta crepes that you make yourself! Don’t worry, it is easy. Don’t be intimidated and get the manicotti shells pasta in the box. These are in a completely different league. If you can make a pancake, you can make these. You can also wrap the crepes in plastic wrap and freeze them, or store in the refrigerator for a few days. You will also need sauce and some extra mozzarella for melting on top. Simply whisk together all of the ingredients for the crepes in a bowl until smooth and well mixed. Cover and place in your refrigerator for about a half hour. Add the other ingredients slowly while stirring. Heat a small skillet and lightly coat with oil. Use medium heat. Pour about a 1/3 cup of the crepe mix into the pan and rotate the pan, so that the mixture covers the entire bottom of the pan. After cooking for about a minute, the edges will start to turn brown and start to lift. That is your signal to flip the crepe over and cook for about another half minute. Remove the crepe from the pan and place on waxed paper. Continue with the remaining batter to make all of your crepes in the same way. At this point, we have our filling and crepes. Now, we need to assemble the Manicotti. Ladle some sauce in the bottom of a casserole dish, or 13 x 9 pyrex baking dish. Spoon about a ¼ cup of the filling onto a crepe. Roll the crepe and place in the casserole dish seam side down. Repeat for all of the manicotti. When all of the manicotti are rolled and in the pan, ladle some sauce on top. I usually sprinkle a little mozzarella and parmesan on top at this point. Cover with foil. Make a tent, so that the cheese doesn’t stick to the foil. Serve piping hot! Enjoy with some garlic bread, a nice salad and a glass of Chianti!